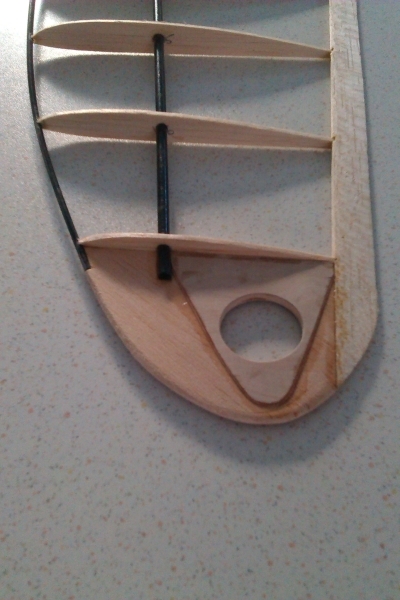 The PSS is based on the Bug scaled up to 960mm, the leading edge is the second section from a fishing rod and the main spar is the third section, the wingtip is strengthened with .5mm ply to carry the throwing peg (still needs more lightening holes) I have also put some strips of .5mm ply onto the ribs to take the load of the leading edge. 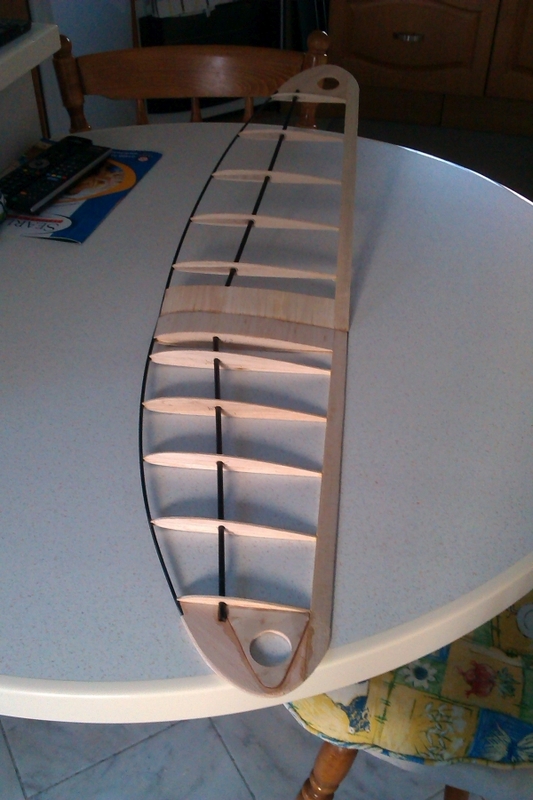 Finished a/w covering and battery, I have used one section of the fishing rod for the fuselage boom, it's a bit bendy so I might have to change it later, just couldn't resist trying it to see what happens! The fuse is made from .4mm plywood and 3/32" sheet laminates for the formers and wing deck, turned out quite light and solid. Radio Orange RX " 2 off Turnigy servos Weight so far 129gms. 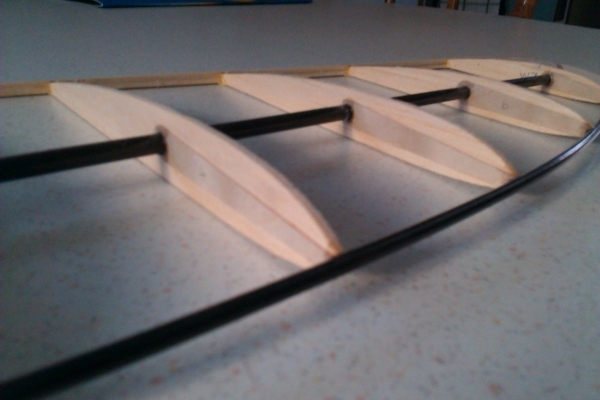 The wing is fitted with anylon bolt at the TE and a dowel retainer at the front, control rods are thin piano wire push pull and I found a section from a different fishing rod that is much stiffer, Hey Ho we shall see. The most expensive piece so far is the .4mm ply! 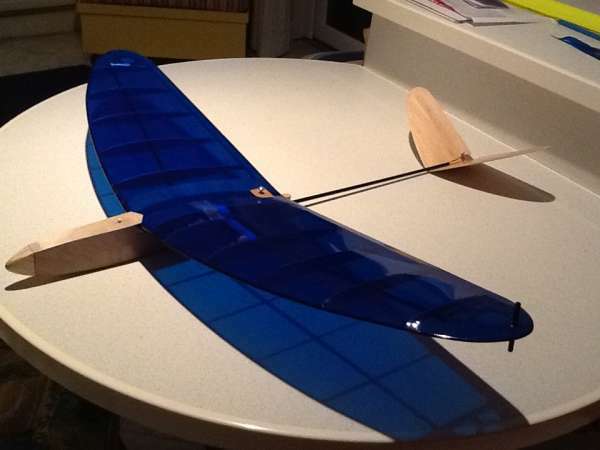 I missed my 150gm target, the finished model with 3cell Nicad came out at 173 gms, this includes 3gm tip weight to balance the wing and counteract ply strengthening and launching peg. 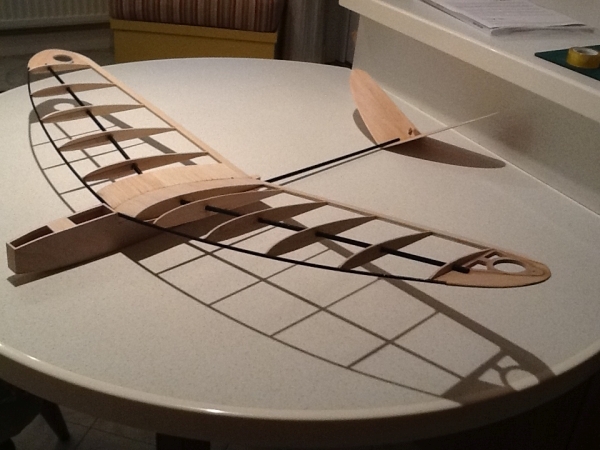 It didn't need any extra weight to obtain C of G. The tail boom worries me!! There was some general discussion as to which Pound Shops stocked the fishing rods. Dave said he got his from the Pound Shop, opposite Westgate House, on Park Road, whilst they weren't in stock at the Bretton branch, or the one in Melton Mowbray, come to that.